There&apos;s no doubt Kim Kardashian is among one of Hollywood&apos;s most stylish stars, but when she prepares to go out on a date with new boyfriend Kanye West the reality star knows she has to up her fashion game. In a new clip from Monday&apos;s Keeping Up With the Kardashians, the 31-year-old turns to rapper West, 35, for wardrobe inspiration when preparing to attend Scott Disick&apos;s RYU restaurant opening in April in New York City. "I am so happy Kanye is coming with me to Scott&apos;s restaurant opening," Kardashian says as West (who has his own fashion line), offers his opinion on her date-night dress, jewelry and purse. "I don&apos;t want to make a big fuss about it — we&apos;re just hanging out." Albert Michael/startraksphoto.com Kim Kardashian and Kanye West at RYU on April 23, 2012. Dating since March, Kardashian and longtime family friend West appear to be on the relationship fast track. "They&apos;re seriously talking marriage. 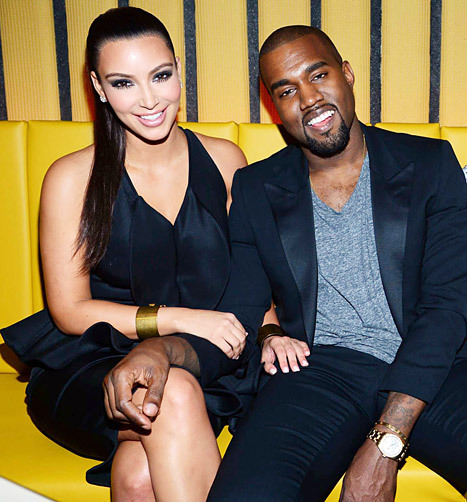 And yes, she would [accept his proposal]," a source close to the couple confirms to Us Weekly. "Kanye says he can&apos;t wait to see her carrying his child. He says she will look beautiful pregnant." Keeping Up With the Kardashians airs Monday at 9 p.m. (EST) on E!